Utah, Omaha, Gold, Juno et Sword beach, 5 code names which entered History, 5 objectives for victory. Initially planned for 5 June, Operation Neptune, the biggest amphibian military operation of the Second World War, was delayed until the following day due to adverse weather conditions. Several assault phases had been planned for the initial stages of the soldiers’ landings on the beaches: a massive airborne operation and intensive bombing in order to neutralise the German defences. 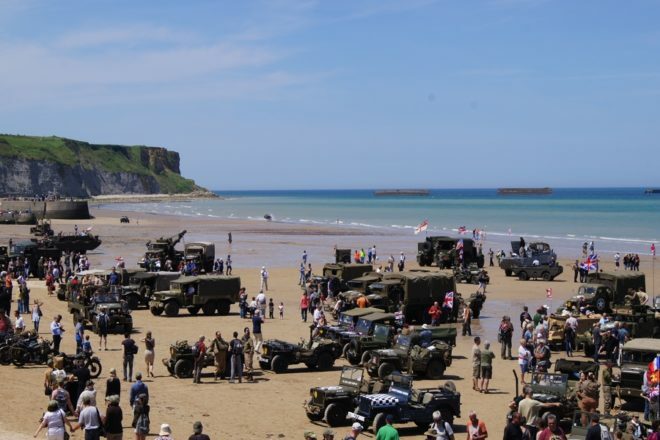 A variety of ways to visit the D-Day beaches is on offer in the area of Bayeux and the surrounding Bessin area. Minibus excursions with a driver-guide are available from many hotels. A different perspective on the events of 6 June can be gained by flying over the beaches in a microlight or paraglider. You can also climb into one of the famous Willys MB jeeps for a ride along the chaotic roads of Liberty….